Waiting to bat, originally uploaded by The Bacher Family. 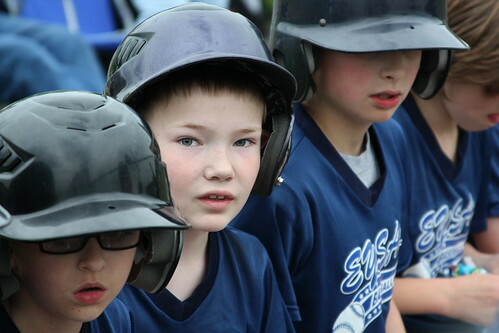 I like the angle of this picture of Daniel on the batting bench, because it has a real sense of depth to it. What makes it work is that Daniel stands out from those around him in several ways. He's the only one in focus, he's the only one whose face isn't hidden, his face is more brightly lit than any other. As such, the eye is drawn to him, even as those around him put him in a three dimensional context.